There are fewer worlds in the SW:TOR galaxy now, but each supports "a significantly higher number of players." 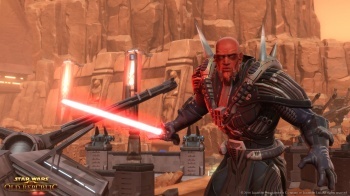 A short while ago Star Wars: The Old Republic reported a drop in player population during peak hours. At the time BioWare said that, although subscriptions hadn't dropped, the number of people logging in had. Now SW:TOR servers have been merged; there are fewer servers, but each has been modified to support "a significantly higher number of players", according to the official BioWare announcement. Those who have to change their character or guild name as a result of moving from one server to another may feel particularly annoyed at the switch, but it's been coming for a while. BioWare has been testing high population servers and until yesterday had a Free Character Transfer program in place for those who wanted to jump before they were pushed. Affected players who want to know more should see the FAQ. This news, following on BioWare's switch to free-to-play and the game's disappointing subscription figures announced in May's earnings statement, is yet more sackcloth and ashes for the MMO that at one point hoped it might dethrone World of Warcraft. Fortunately there is hope. The developer has been working on shadow optimization, and made a progress announcement the same day the servers were consolidated. Players now have the benefit of really crisp and realistic self-shadowing on their nice new high-population server, even if that pesky red exclamation mark next to their character name means they'll have to call Darth Lasagne something else.